The Tribute to the Woodlands Music Festival features great cover bands playing popular hits from the ’60s, ’70s, ’80s, ’90s, and ’00s. 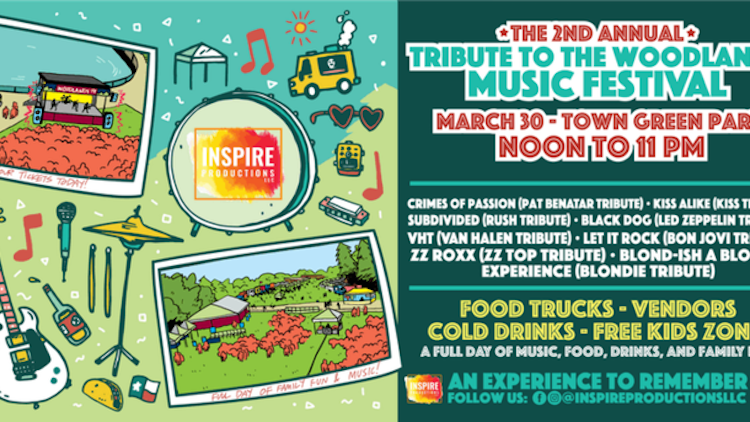 Experience Pat Benetar tribute Crimes of Passion, KISS tribute Kiss Alike, ZZ Top hits via ZZ Roxx, Rush tribute Subdivided, Led Zeppelin tribute Black Dog, Bon Jovi music performed by Let it Rock, and more. There will be food trucks offering delicious food and cold drinks for purchase, plus a free kids zone. Tickets are $5, but limited, discounted $2.50 tickets are available. This article is a Commerce Calendar Listing, which is independent of our editorial and advertising / sponsored content. If you purchase tickets or sign up for more information, 365 Houston may receive a small share of the sale at no additional cost to you.